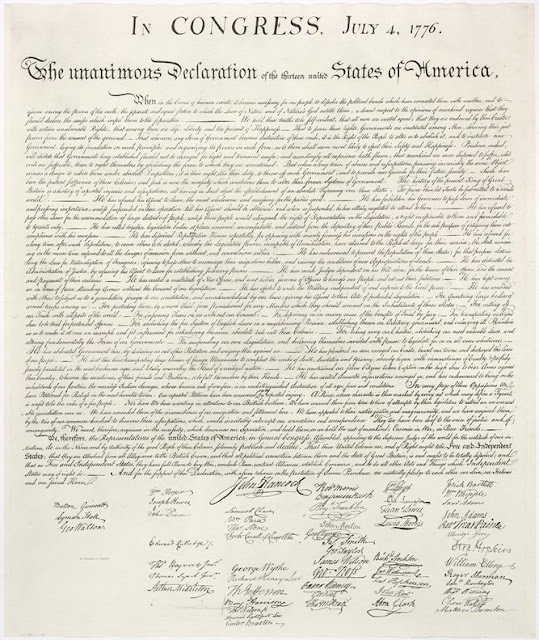 Over the years, the below passage has been posted to more than a few websites and has visited many by way of email, but on the day of our nation's birth, I believe it serves us well as a reminder about the courage, sacrifice and tenacity of the men who pledged "our lives, our fortunes and our sacred honor" in pursuit of Liberty. "Fifty-six men from each of the original 13 colonies signed the Declaration of Independence on July 4, 1776. Nine of the signers were immigrants, two were brothers and two were cousins. One was an orphan. The average age of a signer was 45. Benjamin Franklin was the oldest delegate at 70. The youngest was Thomas Lynch Jr. of South Carolina at 27. Eighteen of the signers were merchants or businessmen, 14 were farmers, and four were doctors. Twenty-two were lawyers - although William Hooper of North Carolina was "disbarred" when he spoke out against the king - and nine were judges. Stephen Hopkins had been governor of Rhode Island. Forty-two signers had served in their colonial legislatures. Thomas McKean of Delaware wrote John Adams that he was "hunted like a fox by the enemy - compelled to remove my family five times in a few months." Abraham Clark of New Jersey had two of his sons captured by the British during the war. Fifteen of the signers participated in their states' constitutional conventions, and six - Roger Sherman, Robert Morris, Franklin, George Clymer, James Wilson, and George Reed - signed the U.S. Constitution. Adams, Jefferson, and Carroll were the longest surviving signers. Adams and Jefferson both died on July 4, 1826, the 50th anniversary of the Declaration of Independence. Carroll was the last signer to die in 1832 at the age of 95."